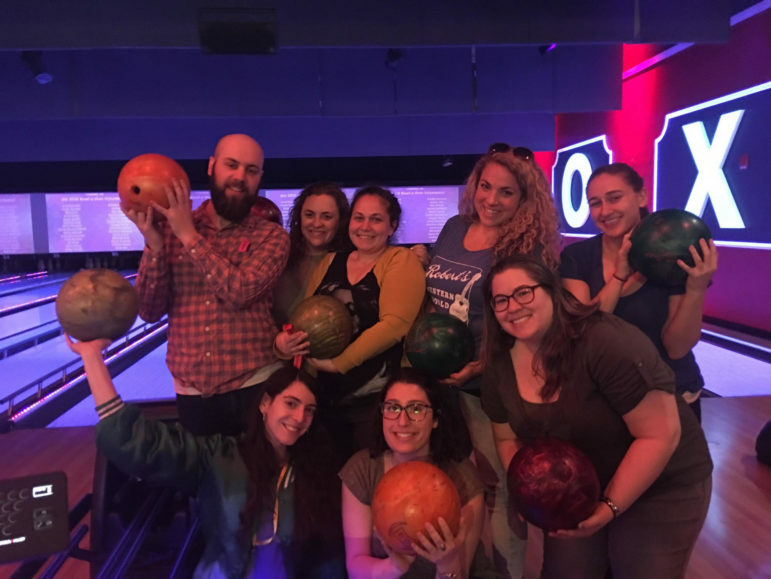 Avodah NY Justice Fellowship Cohort ’16-’17 participate in a bowl-a-thon to raise funds to increase abortion access for low-income women and families. A few weeks ago, I and a few friends organized a group to go bowling. It wasn’t an ordinary Sunday bowling outing, we were bowling to raise money for the New York Abortion Access Fund in New York for The National Network of Abortion Funds. The more I thought about asking friends and family to donate money to this philanthropic effort, the more I thought about what it means to be a man raising money for abortion access in The United States in 2018. The most alarming part of the day, was looking around the bowling alley, and only seeing five or so other men in attendance. The event and our list of donors had one thing in common, it was made up almost completely of women. In a country that seeks to provide freedom and equality for all citizens, why are we as men, not doing what we can to help our sisters, mothers, and daughters provide the care they need? What is our responsibility as men to help fund abortions for those in need? The topic of abortion in the US is a complicated and gets more difficult to understand once we start talking about it on a national level, so I will restrict this article to discussing abortion access in New York State. There are some states that are terrible for abortion access, New York is not one them. However, there still can be more done to help those in need of obtaining access who seek these services. New York state requires that all insurance providers cover abortion procedures. According to Perspectives on Sexual and Reproductive Health, 2017, In 2014, 44% of New York counties did not have clinics that performed in abortions, 10% of women lived in those counties. In New York state it is illegal to perform an abortion past 24 weeks of a pregnancy unless the life of the woman is in immediate threat. Although there are seven states that do no limit the gestational age that a woman can terminate a pregnancy, New York state is not one of them. If you live in The United States, you will know that not everyone is covered by a health insurance plan. That leaves a substantial amount of women on their own to cover these costs. Depending on the stage of the fetus, abortions can cost up to $600. Basic healthcare costs and preventive care should not lead to women and families to decide on to choose to take care of their bodies or pay their rent. Presumably, we are under the assumption that women who are considering abortions are connected to men in some way. Where does the responsibility lay with men and their involvement of abortions, support, and responsibility in the stages of pregnancy? We know that men are overwhelmingly involved in creating laws that restrict women from choosing how and when they can receive services, but men must take on more responsibility to help women gain more access, funding and opportunity regarding resources. I agree with Iggy Pop who said, “I’m not ashamed to dress “like a woman” because I don’t think it’s shameful to be a woman.” And that’s true, so why is it so hard for women to make their own choices when it comes to receiving care for their bodies? Men must help to eradicate the public shame and embarrassment of obtaining an abortion. We can do this by speaking more with other men about times in which we have been part of these decisions, conversations, or have known those who have seeked these services. It is up to men to educate other men on how to support these causes. If that means understanding the threat to closing Planned Parenthood clinics, preventing the distortion of the Religious Freedoms Act which prevents insurance providers or doctors from supplying services based on religious influence. But why should we as men care about this issue? If we care about a healthy country, about justice for all, and compassion for our fellow citizens, we must support those who are demanding control of their bodies. We must help the eliminate the preventive measures that exist that make it harder for women to access care. As stated on the Abortionfunds.org website mentions the subject of intersectionality: “ A comprehensive vision of justice for our communities must involve working towards economic, racial, gender, and reproductive justice.” By helping women, we begin the process of helping everyone. When men get more involved with these issues, they are able to help those from multiple races and socioeconomic backgrounds. Restricting abortion access will have a disastrous effect on Black and hispanic communities, most of whom receive these services at a higher rate than white women. When men help those in need from continuing the cycle of poverty, we are creating a healthier and safer state for all. Let’s start showing up for women. Let’s start making calls. Let’s build power together by joining marches, learning more about feminism, buying cool-shirts and talking to other men about how to be allies. In New York, we have an opportunity to pass the Reproductive Health Act and the Comprehensive Contraceptive Coverage Act to better help women and men decide what is best for them and their families. Our group didn’t solve the problem by going bowling this weekend, but we raised a little bit of money to help someone will need an abortion in the future. There are a few more people who will acknowledge that showing up for causes that improve women’s access to healthcare is worthwhile. Most importantly, a few more woman will have the ability and access to decide whether or not they want to go through with her pregnancy. Let us as men, provide more support, more funds, and more power for abortion access, for healthcare, for equal rights, and as bowling partners. This entry was posted in #weareavodah, Alumni, Fellowship, New York and tagged abortion, abortion access, women's health, women's rights. Bookmark the permalink.